Moet Chandon continues to travel the French water ways with her new owners Warren & Bernie Starbuck (their last boat Ali M) and Barry & Pam Turner. We hope this dream life aboard Moet continues for both couples, we wish you all every happiness. Canal2mers - Mailing list to facilitate the transfer of information between boaters cruising the canals Lateral a la Garonne, Midi, and Rhone a Sete in SW France. Burgundy Loop - Email information exchange for boaters in Burgundy: Saone River, Canal de Bourgogne, Petite Seine, Canal du Nivernais, Yonne River, Canal de Vermenton, Canal du Centre, Canal de Roanne à Digoin, Canal Latèral a la Loire, Canal de Briare, and Canal du Loing. 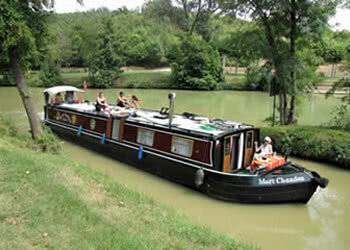 We enjoyed good moorings in all the ports while cruising from Moissac to Buzet and back on the Canal de Garonne. The Canal du Midi is like a fine wine you take it in slowly, taste and sample every village as you cruise discover as much as you can along the way. 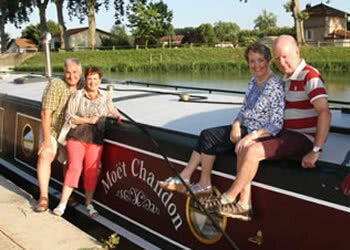 Our web site is intended to help us keep in touch with family and friends whilst living aboard our boat "Moët Chandon". We never tire of the different landscape here in the South of France, the different medieval villages also the wonderful Mediterranean light which draws me out of the boat time and time again to photograph and capture the moment, especially when sharing it with family or friends for the first time that is always a bonus for John and I. The scenery is so varied and impressive especially the medieval villages, the wonderful Gorge's we visit, and the patchwork of vines seen here just outside Carcassonne all are typical of the Languedoc we love this area ~ hence it is now our third winter here in the port of Carcassonne. Many friends we have made who are living in this area. House hunting might be on our agenda. Lots of walking and exercise for our creaking bones (those damned locks can be so hard at times, but we do love them). We enjoy lots more fresh air and we are constantly meeting other boaters. We have time to stop, just chat and exchange ideas, give support to each other. It's also nice to spend more time with family and friends (though still never enough time). We now have time for US! It's a time to discover what we both want for this next phase of our lives. We hate packing and unpacking when traveling and we have done a great deal of traveling over the years. We are learning to live with less baggage, so buying a boat seemed a good solution, our home comes with us... and we can move on when we are ready to! The high maintenance of the boat keeps us busy. Moet Chandon keeps us on our toes and there's never a dull moment with her. It thrills us that our children share our passion for the Moet and want to join us when they can, which is a wonderful bonus. Thanks for dropping in, we hope you enjoy joining us as we cruise France to discover new and exciting things. Hopefully it will be a way for you to see where we're at and what we're up to. You never know you might want to come and join us for some time out, our kettle is always on.